We describe the diverse steps to implant chronic silicon probes and to record place cells in mice that are running head-fixed on a cue-enriched treadmill apparatus. Sariev, A., Chung, J., Jung, D., Sharif, F., Lee, J. Y., Kim, S., Royer, S. Implantation of Chronic Silicon Probes and Recording of Hippocampal Place Cells in an Enriched Treadmill Apparatus. J. Vis. Exp. (128), e56438, doi:10.3791/56438 (2017). An important requisite for understanding brain function is the identification of behavior and cell activity correlates. Silicon probes are advanced electrodes for large-scale electrophysiological recording of neuronal activity, but the procedures for their chronic implantation are still underdeveloped. The activity of hippocampal place cells is known to correlate with an animal's position in the environment, but the underlying mechanisms are still unclear. To investigate place cells, here we describe a set of techniques which range from the fabrication of devices for chronic silicon probe implants to the monitoring of place field activity in a cue-enriched treadmill apparatus. A micro-drive and a hat are built by fitting and fastening together 3D-printed plastic parts. A silicon probe is mounted on the micro-drive, cleaned, and coated with dye. A first surgery is performed to fix the hat on the skull of a mouse. Small landmarks are fabricated and attached to the belt of a treadmill. The mouse is trained to run head-fixed on the treadmill. A second surgery is performed to implant the silicon probe in the hippocampus, following which broadband electrophysiological signals are recorded. Finally, the silicon probe is recovered and cleaned for reuse. 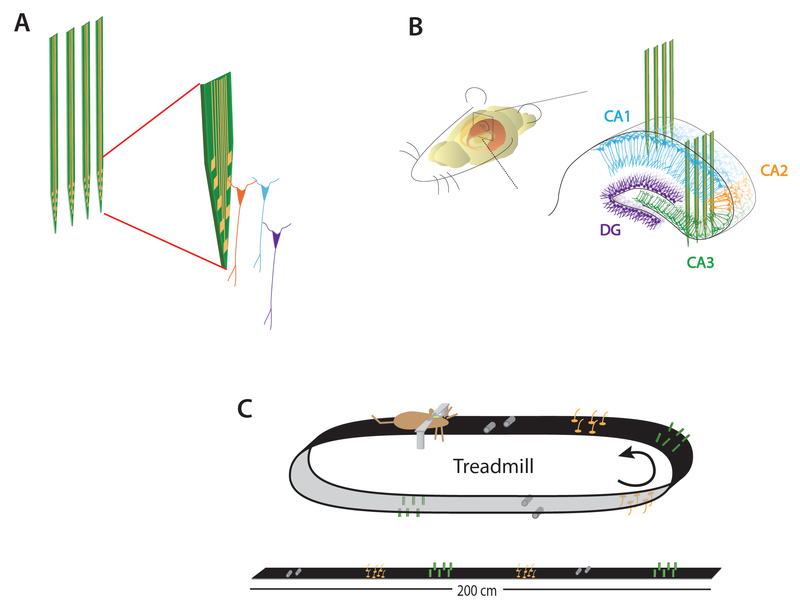 The analysis of place cell activity in the treadmill reveals a diversity of place field mechanisms, outlining the benefit of the approach. Silicon probes present several advantages for electrophysiological recordings, including the fact that they are designed with sharp profiles minimizing tissue damage and that they present a precise layout of densely packed recording sites1,2,3,4. They are used to study various systems in different species, including humans3,5,6, with diverse approaches1,7. Yet, their recurrent use is still relatively limited because of their cost, fragility, and the fact that convenient methods for chronic experiments are lacking8. Recent advances in 3D printing technology have made possible the custom designing of devices such as micro-drives and head-plates to allow an easier handling of these delicate electrodes. In a first step, we will describe how to build and use a set of tools that we have developed for the implantation of chronic silicon probes14. While place cells are typically studied using freely-moving animals running in mazes, recently they were also investigated in virtual environments15 and in treadmill apparatii9 (Figure 1A). These experimental methods offer the advantage that animals can be head-restrained, making the use of 2-photon microscope15, patch-clamp16, and optrode9,10,11 techniques easier, in addition to providing enhanced control on animal behavior and environmental cues12. In a second step, we will present the procedures for training mice and recording place cell activity in a treadmill apparatus. All methods described have been approved by the Animal Care and Use Committee of the Korea Institute of Science and Technology. Print the parts of the micro-drive (slider, body, and shell)14 using a high-resolution 3D printer. Make sure the parts have no defects. Fix the slider into the micro-drive body with a screw (size 000-120x1/4). Solder a nut (size 000-120x5/64 Hex) onto the tip of the screw. Rotate the screw clockwise to move the slider up or counter-clockwise to move it down. Fix the shell to the body with a screw (size 000-120x1/4). Mounting the probe on the micro-drive. Fix the micro-drive in a horizontal position under a binocular microscope. Use a flat alligator clip with rubber padding to grab the flex cable of the silicon probe, while carefully detaching the probe from the shipment enclosure with forceps. Fix the alligator clip to a manipulator. Using the manipulator, lay the silicon probe on the micro-drive slider, parallel to the direction of movement. Apply a drop of dental cement (room temperature-curing acrylic dental repair material) to fix the probe to the slider. Correct the probe position if it has shifted. Glue is not recommended as it cures very fast and makes it difficult to readjust the electrode position. Fix the connector of the probe to the C-holder (connector holder) with dental cement. Cleaning and putting dye on the probe. Fix the Microdrive/probe assemblage on the probe-cleaning device. The device is equipped with 2 small rotating foam sponges (non-sterile swabs). Adjust the gap by the manipulator. Soak the sponges with detergent. Slowly move the probe up and down between the sponges, allowing a gentle touch. Monitor the cleaning process under a microscope. Rinse the probe with distilled water. Dip the probe in alcohol for sterilization. Apply Dil (lipophilic fluorescent dye) on the back of the shanks of the probe, using a foam swab. This will allow in a later stage the visualization of shank locations in the brain. Print the parts of the hat (head-plate, connector holder, and cap)14 using a 3D-printer. The 3 parts fit together to form a sealed enclosure. Insert nuts (size M2 and 00-90x1/4) in the slots of the head-plate and fix with glue and dental cement. Insert a washer in the slot of the cap and fix with dental cement. All tools used for surgery are sterilized beforehand by autoclaving. A dry heat beads device is used forto sterilize tools that become contaminated and need to be sterilized during the surgery. Set the level of isoflurane to 4% for the initiation of anesthesia. Put the mouse in the anesthesia chamber for 5 min. Install the mouse in a stereotaxic apparatus. Reduce the isoflurane level to 1.5-2%. Adjust the level during the surgery according to animal state, breathing rate, and body temperature20. Apply eye ointment on the eyes. Shave the scalp and clean the head of the animal with antiseptic (iodopovidone). Maintain aseptic conditions during all steps of the surgery. Inject bupivacaine (1 mg/kg) under the scalp. Cut and remove part of the parietal skin of the mouse head using fine scissors to expose the skull at its edges. Use saline and a hemostatic sponge to clean and control the bleeding during the surgery. Remove the periosteum using a scraper tool. Find the reference points on the skull21: bregma, lambda, coronal, and sagittal suture. Adjust the head's angle along the sagittal axis such that the Bregma and lambda points are at the same height. Drill two holes (~0.5 mm diameter) in the skull for the reference and ground electrodes. The holes should be approximately 1 mm caudal and 1 mm lateral of the Lambda. Insert the ground and reference electrodes (size 000-120x1/16 miniature stainless-steel screws wire-coupled to pin connectors). Apply ultraviolet (UV) light bonding dentin activator on the skull and then apply UV light for 45-60 s.
Apply a layer of dental cement on the edges of the skull. Avoid spreading cement on the skin and hair of the mice. Fix the head-plate to a stereotaxic manipulator and position it above the skull. Slowly lower the head-plate until it slightly touches the skull, and apply dental cement at the junction with the skull. Let the dental cement cure for 15 min. Remove the anesthesia. Fix a connector-holder and a cap to the head-plate. Put the mouse in its cage after giving a sub-cutaneous injection of ketaprofen 5 mg/kg. Give sub-cutaneous injections of ketaprofen 5 mg/kg for the two next days and monitor carefully for any sign of pain. Mice typically wake up from anesthesia within 20-40 min. The hat implant is relatively light (3.34g), such that mice have no trouble to lift their head, run in mazes and climb on the edges of their home cage. After a post-surgery recovery period of 7 days, start the restriction of water at 1 mL per day. To make the treadmill belt, cut a piece of velvet fabric (5 cm by 1-2 m) and fix small objects on it using hot glue. Attach erected objects on the edges of the belt in order not to interfere with the motion of the mouse. Fix the belt on the wheels of the treadmill by suturing together the two ends. Install the mouse head-fixed in the treadmill by inserting and tightening the two screws of the head-plate into the slots of the head-fixation plate. Start training the mouse to run head-restrained on the treadmill for the water reward. Deliver the water reward through a lick port. Initially, put the mouse on the treadmill for periods of 10 min, 3 times per day. As the mouse gets used to the head-fixation and starts to move the belt (typically after ~3 days), increase the training session duration to 30 min. After 2-3 weeks, some mice run more than 100 trials in 30 min (a trial being a full rotation of the belt). Choose the mice showing the best behavioral performances for the recording experiments. Put the mouse under anesthesia. Install the mouse in the stereotaxic apparatus by fixing the head-plate. Clean the skull surface with saline. Find stereotaxic markers: bregma, lambda, coronal, and sagittal suture. Measure the distance to the point of insertion and mark it. Drill the bone carefully until it becomes thin and transparent. Moisten and clean with saline while drilling. Carefully remove the thinned bone and the Dura matter using precision forceps. Keep the brain surface wet with saline all the time. Fix the Microdrive/silicon probe assemblage to a stereotaxic manipulator. Bring the silicon probe just above the craniotomy. Screw the silicon probe connector holder to the head-plate. Connect the recording amplifier and ground/reference electrodes. Shield the mouse with aluminum foil to protect from electro-magnetic noise. Start the recording system to monitor the electrical activity of the brain. Slowly insert the silicon probe into the brain using the micromanipulator. Continuously check the electrical signals, the manipulator travelled distance, and the shanks of the probe (make sure they are penetrating in the brain). Unit activity is visible in the cortex while the white matter underneath is relatively silent. Unit activity reappears when the shanks touch the pyramidal layer of the hippocampus. From this point, retract the silicon probe 200 µm (use the micro-drive the next day to bring the shank back into the pyramidal layer). Cover the surface of the brain with a mixture of bone wax and mineral oil. Fix the micro-drive to the head-plate using dental cement. Let the dental cement cure for 15 min. Then detach the micro-drive from the stereotaxic manipulator and put the hat cap back on. Put the mouse back in its cage and give a sub-cutaneous injection of ketaprofen 5 mg/kg. Check for any sign of pain. This surgery is much less invasive than the first one and mice are typically active within 45 min after they wake-up from the anesthesia. However, let the mouse recover an entire day as the silicon probe needs to stabilize in the brain. Install the mouse head-fixed on the treadmill. Remove the hat cap. Connect the recording amplifier and start the recording. On the first day, use the micro-drive to move the silicon probe into the pyramidal layer of the hippocampus. Each counter-clockwise turn of the screw moves the shanks 200 µm deeper. Adjust the shank position slowly (~20-50 µm at a time) until ripple oscillations13 and unit activity appear. On the next days, tune the shank position and wait ~1 h before recording the hippocampal activity while the mouse runs on the belt. To maintain good recording signal quality for several days, remove hard objects and low ceiling from the mouse's cage to minimize the chance the hat bumps into hard surfaces. Install the mouse in the stereotaxic apparatus by fixing the head-plate. Remove the hat cap. Bring the stereotaxic manipulator just above the micro-drive. Fix the micro-drive to the manipulator. Unscrew the connector holder from the head-plate. Remove the screw connecting the shell and body of the micro-drive. Under binocular microscope supervision, slowly pull up the micro-drive/silicon probe assemblage with the stereotaxic manipulator, leaving the shell part behind. Clean the silicon probe with the cleaning device. A mouse was first trained to run on a two-meter long belt devoid of cues (Figure 1C). Following electrode implantation, a new belt of the same length but presenting 3 pairs of cues was installed on the treadmill, in order to generate allocentric spatial representations12,14. Broadband signals were recorded at a sampling rate of 30,000 Hz, using a 250-channel recording system (amplifier board with USB interface board and custom-made Labview interface) and two silicon probes (Figure 1A, 4 shanks, 8 sites per shanks) implanted in CA1 and CA3 (Figure 1B). Units were detected using a threshold function on the high-pass filtered signals (0.8-5 kHz). Cell isolation was performed using a semi-automatic spike sorting method15,16,17. The forward/backward motion of the treadmill was monitored using LED and photo-sensor couples and recorded by digital input channels of the recording system. An average of 148±35 cells (mean±s.e.m) could be isolated in each session, among which 38.4±3.5% showed clear place field activity (Figure 2). The place fields were relatively stable across many trials, in either the initial day of recording (Figure 2A) or after several days of exposure to the cued belt (Figure 2B and Figure 2C). Different types of spatial representations could be discerned. Some cells showed repeated place fields correlated with the identity of the cues (Figure 2A), while other cells showed a unique place field (Figure 2C)12. Hence, we could record hippocampal place cells over several days and identify a diversity of place field mechanisms, two important requisites for studying the mechanisms and dynamics associated with spatial navigation, learning, and memory. Figure 1: Silicon probe and treadmill apparatus. (A) Shank and site layout of silicon probe. (B) Implantation site. (C) Treadmill apparatus and layout of cues on the belt. Please click here to view a larger version of this figure. Figure 2: Chronic recording of place cells. (A) Color coded representation of place fields (top), spike auto-correlogram (bottom left) and spike waveforms (bottom right) for a cell example recorded on day 1. (B-C) Same as (A) for cells examples recorded on day 3 (B) and day 5 (C). Please click here to view a larger version of this figure. Chronic recording of neuronal activity is critical for understanding neural processes such as hippocampal place fields. Our approach to perform chronic silicon probe implantantation distinguishes itself from other methods7,18,19,20 by the fact that it is relatively simple to recover the electrode package at the end of the experiment. While place cells are typically studied in freely-moving conditions, the treadmill apparatus not only significantly simplifies experimental design and data analysis, it also allows researchers to scrutinize place field mechanisms in minimal contexts during many repetitions of stereotyped animal trajectories12. It is also much simpler to build than virtual reality systems, since it only requires 3D-printed wheels, one-dimensional motion sensors, and a microcontroller. Stable place field activity could be recorded over many days, an important requisite for investigating the long-term network dynamics associated with learning. In this respect, some issues should be considered. 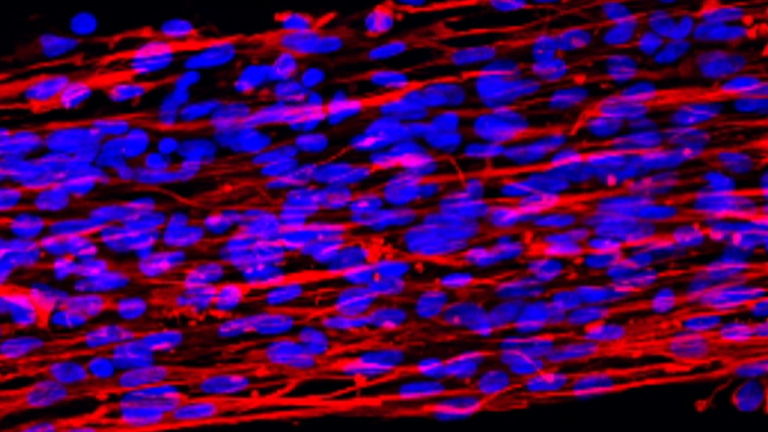 First, the processes of brain tissue degeneration and scar formation around the silicone probes might themselves generate long-term variations in activity patterns. It is therefore important for all surgical procedures to be done carefully to cause minimal damage to brain tissues and blood vessels. Second, it is relatively difficult to track individual cells over consecutive days, because of electrode drifts in the brain14. In this respect, imaging techniques such as two-photon microscopy and micro-endoscopy might be better suited, as cell identity can be traced from the morphology and spatial configuration of cells21,22,23. They also allow a larger yield in term of number of cells recorded and provide direct information about cell gene expressions24. However, imaging techniques are quite invasive when deep brain regions are concerned and cannot resolve single action potentials as they mainly rely on calcium signals. Hence, an optimal solution for longitudinal studies might be to combine both optical and electrophysiological approaches. Finally, it is worth noting that the set of techniques we have described might be easily adaptable for other types of electrode, including Neuropixels (https://www.janelia.org/lab/harris-lab-apig) and optrodes11,25,26, and can be used in a range of experimental models other than hippocampal place cells. With the fast progress in 3D-printing technology, the further improvement and customization of recording and behavioral devices should become more and more straightforward and accessible to the labs. This work was supported by the Korea Institute of Science and Technology Institutional Program (Projects No. 2E26190 and 2E26170) and the Human Frontier Science Program (RGY0089/2012). Suner, S., Fellows, M. R., Vargas-Irwin, C., Nakata, G. K., Donoghue, J. P. Reliability of signals from a chronically implanted, silicon-based electrode array in non-human primate primary motor cortex. IEEE Trans Neural Syst Rehabil Eng. 13, (4), 524-541 (2005). Csicsvari, J., et al. Massively parallel recording of unit and local field potentials with silicon-based electrodes. J Neurophysiol. 90, (2), 1314-1323 (2003). Hochberg, L. R., et al. Neuronal ensemble control of prosthetic devices by a human with tetraplegia. Nature. 442, (7099), 164-171 (2006). Okun, M., Lak, A., Carandini, M., Harris, K. D. Long Term Recordings with Immobile Silicon Probes in the Mouse Cortex. PLoS One. 11, (3), e0151180 (2016). Vandecasteele, M., et al. Large-scale recording of neurons by movable silicon probes in behaving rodents. J Vis Exp. (61), e3568 (2012). Kipke, D. R., et al. Advanced neurotechnologies for chronic neural interfaces: new horizons and clinical opportunities. J Neurosci. 28, (46), 11830-11838 (2008). Royer, S., et al. Control of timing, rate and bursts of hippocampal place cells by dendritic and somatic inhibition. Nat Neurosci. 15, (5), 769-775 (2012). Boyden, E. S., Zhang, F., Bamberg, E., Nagel, G., Deisseroth, K. Millisecond-timescale genetically targeted optical control of neural activity. Nat Neurosci. 8, (9), 1263-1268 (2005). Royer, S., et al. Multi-array silicon probes with integrated optical fibers: light-assisted perturbation and recording of local neural circuits in the behaving animal. Eur J Neurosci. 31, (12), 2279-2291 (2010). Geiller, T., Fattahi, M., Choi, J. S., Royer, S. Place cells are more strongly tied to landmarks in deep than in superficial CA1. Nat Commun. 8, 14531 (2017). Ylinen, A., et al. Sharp wave-associated high-frequency oscillation (200 Hz) in the intact hippocampus: network and intracellular mechanisms. J Neurosci. 15, (1 Pt 1), 30-46 (1995). Battaglia, F. P., Sutherland, G. R., McNaughton, B. L. Local sensory cues and place cell directionality: additional evidence of prospective coding in the hippocampus. J Neurosci. 24, (19), 4541-4550 (2004). Hazan, L., Zugaro, M., Buzsaki, G. Klusters, NeuroScope, NDManager: a free software suite for neurophysiological data processing and visualization. J Neurosci Methods. 155, (2), 207-216 (2006). Kadir, S. N., Goodman, D. F., Harris, K. D. High-dimensional cluster analysis with the masked EM algorithm. Neural Comput. 26, (11), 2379-2394 (2014). Lewicki, M. S. A review of methods for spike sorting: the detection and classification of neural action potentials. Network. 9, (4), R53-R78 (1998). Battaglia, F. P., et al. The Lantern: an ultra-light micro-drive for multi-tetrode recordings in mice and other small animals. J Neurosci Methods. 178, (2), 291-300 (2009). Blumberg, M. S., Sokoloff, G., Tiriac, A., Del Rio-Bermudez, C. A valuable and promising method for recording brain activity in behaving newborn rodents. Dev Psychobiol. 57, (4), 506-517 (2015). Haiss, F., Butovas, S., Schwarz, C. A miniaturized chronic microelectrode drive for awake behaving head restrained mice and rats. J Neurosci Methods. 187, (1), 67-72 (2010). Dombeck, D. A., Khabbaz, A. N., Collman, F., Adelman, T. L., Tank, D. W. Imaging large-scale neural activity with cellular resolution in awake, mobile mice. Neuron. 56, (1), 43-57 (2007). Villette, V., Malvache, A., Tressard, T., Dupuy, N., Cossart, R. Internally Recurring Hippocampal Sequences as a Population Template of Spatiotemporal Information. Neuron. 88, (2), 357-366 (2015). Ziv, Y., et al. Long-term dynamics of CA1 hippocampal place codes. Nat Neurosci. 16, (3), 264-266 (2013). Danielson, N. B., et al. Distinct Contribution of Adult-Born Hippocampal Granule Cells to Context Encoding. Neuron. 90, (1), 101-112 (2016). Stark, E., Koos, T., Buzsaki, G. Diode probes for spatiotemporal optical control of multiple neurons in freely moving animals. J Neurophysiol. 108, (1), 349-363 (2012). Wu, F., et al. An implantable neural probe with monolithically integrated dielectric waveguide and recording electrodes for optogenetics applications. J Neural Eng. 10, (5), 056012 (2013).